Are you bored, or pretending to be bored in front of the computer, when you really are procrastinating? Would you like to be further distracted from whatever work you were supposed to be doing, like I am now? Of course you do, silly. Well, there are a number of interesting tricks that you may or may have not come across while messing around with the search engine Google. The majority of people already know about Google’s calculator and conversion calculator by typing in those words into the search bar. And for people (mostly me) who have spent way too much time on YouTube watching cat videos, I have figured out that you could play snake while you’re waiting for your kitten videos to buffer. If you didn’t know about playing snake on Google then all you have to do is press the arrow keys, but it helps if you pause on a solid background so you can see what’s going on. Some of the other secret tricks out there that you could do on Google may have went under the radar, but don’t worry, I’ve procrastinated enough already to jot down these ten tricks that I have just Googled in the past half hour. I don’t know why, but somehow Google forgot about a bunch of random dragons hiding in your spread sheets in Google Docs. Apparently, to defeat them all you need to do is press ‘shift’ and ‘F12’ and you’ll be congratulated on your fine job. Have you ever tried to Google directions from “the shire” to “Mordor” on Google Maps? No? Why not? Go ahead and try it and then read the first line. I’ve actually sat there long enough Googling the most random directions until I found out how long it would take to kayak from house in California to Tokyo, Japan (I pushed the walk button for fun). You can also ask Google Maps for directions from Tokyo, Japan to Shanghai, China, get all the usual traffic routes—and an instruction to climb on board a jet ski to make it across the Pacific. Google also recommends that if you’re going from Australia to America that you take your kayak. Are you tired of seeing those oddly relevant ads at the top of your inbox in Gmail? Well, you may or may not have noticed something different about the text advertisements above your messages in your spam and trash folders. Apparently, you’ll see a new recipe for some spam dish in your spam folder and a different recycling tip in your trash folder. There are Easter Eggs hidden in your Android phone and tablet (although it doesn’t work on all Android devices). Try going to ‘settings,’ then click ‘about device/ phone’ and repeatedly tap ‘firmware version’ or ‘Android version.’ If your device is one of the lucky few with the egg then the device will display artwork relating to whatever version of the OS you’re running. If you’re running Honeycomb then will see a blue bumble bee that buzzes Gingerbread users will see the little green android surrounded by a horde of zombies, and Ice Cream Sandwich users will see an army of Nyan Cat-ish Androids encased in ice cream sandwiches zooming around in space. When JellyBean users repeatedly poke the Androidified bean that appears you get a screen full of colorful floating jellybeans which you can swish around the screen. If you like Type “goglogo” into your Google search bar and hit “I’m feeling lucky,” you can enter your name into Goglogo’s box, and you can customize a search page with your name. You can also search on a Google version with a black background via Blackl or a black version via search in color, a red version, orange, yellow, green, blue, purple, pink and a vibrant rainbow. 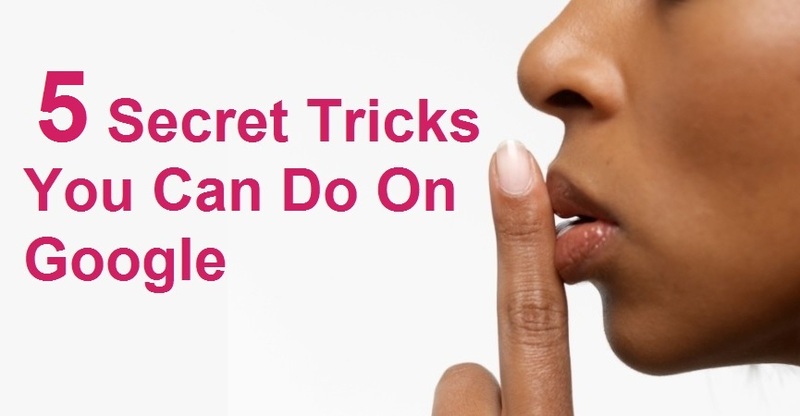 There are dozens of other secret tricks you can do on Google if you stumble around the search engine long enough, but you can discover the rest in time. Sometimes being “bored” rewards you with some of the coolest surprises. You just have to put off your duties long enough to find out.